Life's a Beach | Expat Life in Playa del Carmen : Too many "Goodbyes"
I think one of the most difficult aspects of life in an area that is perceived to be paradise is the transiency of friendships. Yesterday, I sat in a parents' meeting for Cole's class at Papalote and counted familiar faces. It's normal that there should be a few new families but our turnover from year to year seems to run at about 30%. Some of these families have switched to different schools in the area as they try to find the very best fit for their children. However, the majority have simply moved on, or more likely, back to their home country, dreams of an idyllic life in paradise dashed by a harsh reality and the unexpected challenges of life in a foreign country. It tugs hard on my heartstrings when I realize that my children will likely not have those old enduring friendships that Rob and I are blessed with from our steady, suburban upbringings in New York. My closest friends now are women I met in primary school. I can't help but wonder as I watch Cole playing futbol with his best pal, Gabriel, whether their friendship will survive into adulthood. Will my children have any dear old friends? 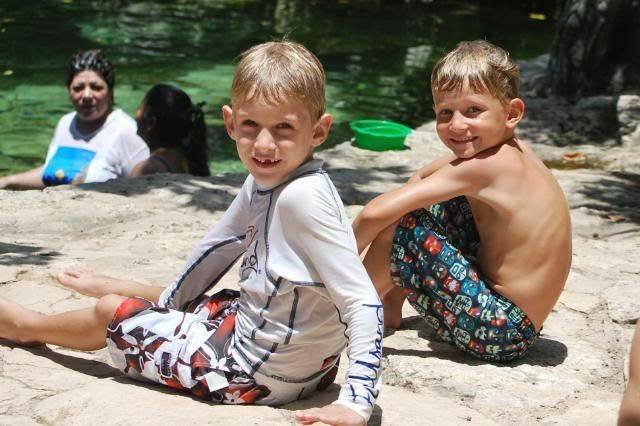 Gabrielito and Cole at Cenote Azul. Of course, this constant flow of new families into and out of Playa has taken its toll on Rob and me as well. Making friends is easy here. Saying goodbye has become easier as well. So many friends have come and gone over the past four years. This quirky town has a hypnotic effect on many visitors, lulling them into a false sense of security, convincing them to pitch it all back home for a "Playa Lifestyle" and selling them a vision of a life that is unrealistic and unattainable by most. Some stay and stick it out for a few years, others, just a few months. As a result, we are, perhaps, a little more guarded, a little less open and slower to envelope newcomers into our personal life. While this transiency has not made us harder, it certainly has caused us to take pause before we get too excited about any new arrivals. Most recently, we said goodbye to Deb, a woman with heart so big and a laugh so infectious you can't help but want to be a part of her life. She returned to Oregon to care for an ailing family member and her presence is sorely missed. There is a hole in "Playa Life" where Deb used to be. Tonight, we say goodbye once again. Mike and Sharon moved to Playa del Carmen with their son Nolan in June of 2007 and quickly won our hearts and the hearts of many, many Playa locals. Sharon has a smile that lights up any room she enters and is one of the kindest women I have had the pleasure of meeting. Mike, when he is not hiding behind the lens of a camera or shooting video, is the consummate gentleman and always ready and willing to lend a helping hand. Together, they have spent countless hours helping local friends and small business owners get the attention and internet exposure needed to survive in this finicky, volatile marketplace. Their brainchild "Playa Tube" has become a huge hit and done wonders for the promotion of Bad Boys Beach Bar, The Nasty B.astards Band, Chris Bolister and The Peanut Pet Shelter, to name just a few. 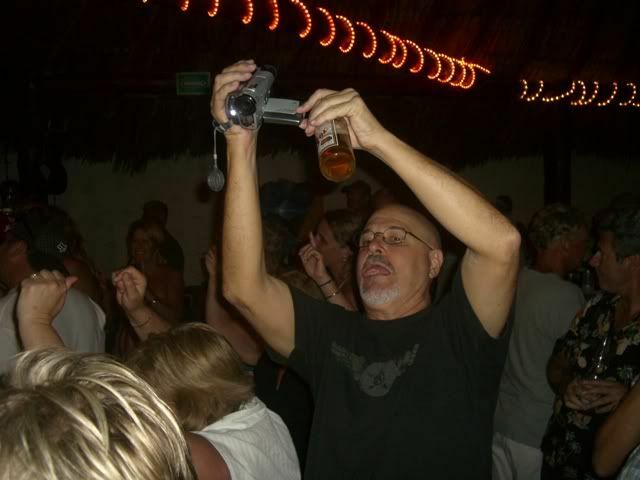 I can't imagine an evening down at Captain Dave’s without Sharon dancing up a storm and Mike recording all the action. Tonight we wish them well and send them back to the US where their son Nolan will have more educational opportunities and organizations that can better address his particular needs. Undoubtedly, we will see them again. Playa has a pull that is hard to resist, drawing people back time and time again to its charming streets, sugar white beaches and clear, turquoise waters. Tonight we gather one last time to celebrate their "Playa Life" and say "hasta luego" as I am certain they will return one day soon. Deb, Tyra (who best not be leaving anytime soon) and Sharon living the "Playa Life" at Captain Dave's. # re: Too many "Goodbyes"
Great blog entry Michele! I just know we will see Deb and Sharon and Mike again though! Once you've been to Playa del Carmen, it's hard to stay away for very long!